Finding a commercial roofing contractor you can count on is a huge benefit to your business. Clients in Springfield, Ohio can count on E&E Construction Company for a variety of commercial roofing services. We’ve earned a reputation for being a trustworthy company with a highly skilled team of roofers. You can reach us at (740) 331-0695 for a completely free onsite estimate! Anyone who understands the roofing industry knows that there is a big difference between commercial roofing and residential roofing. If you hire a company that normally deals with residential roofs, there’s just no way that they can bring the same level of knowledge and expertise to the job. At E&E, we’re a commercial roofing contractor with over a decade of industry experience. Moreover, E&E Construction Company only uses products of the highest quality on our clients’ commercial roofs. 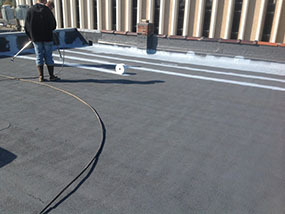 We use Conklin products which have roofing systems that consistently last over 40 years. The brand has withstood the test of time and is a nationally acclaimed manufacturer of roofing products. At E&E, we know that roofs get replaced far too often. Replacements are costly and disruptive to your business. Meanwhile, most roofs can be salvaged with different roofing solutions. This is less wasteful, less expensive, and equally as effective. 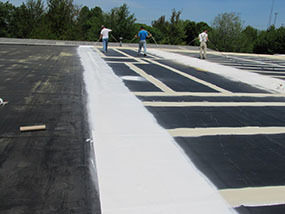 Roof coatings, for example, can be easily applied to the surface of your roof. This seamless layer makes your roof fully waterproof and will lengthen the lifespan of your roof for over 10 years. Plus, this is also an environmentally-friendly option; a roof coating’s high level of reflectivity means that your roof will stay cooler and your commercial building will be far more energy-efficient. Nevertheless, a full roof replacement is sometimes necessary. Our experts will evaluate your roof and run through the best options with you. At E&E Construction Company, we customize our roofing plans to better suit our clients. If you’re looking for a trustworthy commercial roofing contractor, look no further. E&E Construction Company is a proud member of the Choice Roof Contractor Group which shows we are among the elite roofing companies around. Clients in Springfield, Ohio can call us today at (740) 331-0695 for any kind of commercial roofing service.